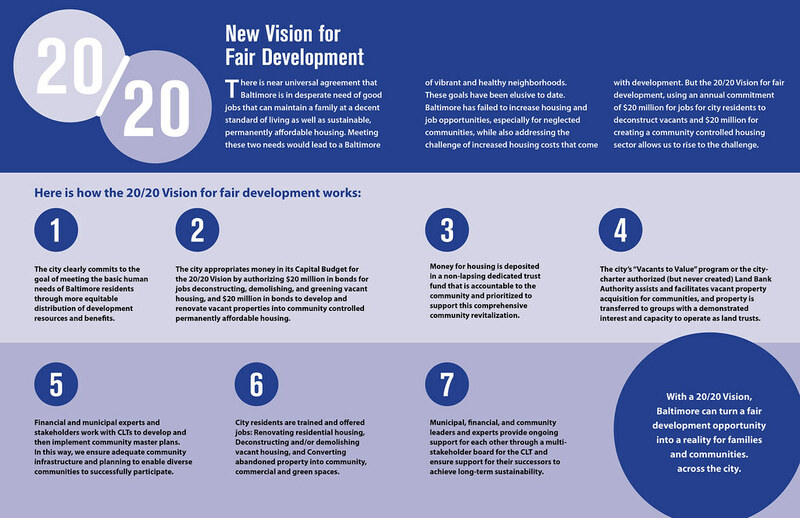 Commit $20 million in public bonds annually invested in community land trust (CLT) housing, deposited in a community-controlled, housing trust fund, and commit $20 million in public bonds annually to deconstruct vacants, create green space, opportunities for urban agriculture. Establish a Land Bank (already authorized by city charter) to facilitate disposition of vacant properties or empower Vacants to Values program to facilitate property acquisition for CLT development. Hire locally: train city residents, give priority given to returning citizens from incarceration for employment in deconstruction and rehabbing vacant property. Support community leaders and organizations with implementing or revising community master plans, providing technical support, and supporting CLTs and community groups with leadership development efforts and leadership succession to ensure long-term sustainability and community participation. Sign on to endorse the 20/20 vision here!